Do you even need to hire a cleaning company? Many do, many do not. By following these tips, you may find that keeping your facility clean and neat is easier than you thought. Also, if you do need an outside cleaning company, following these tips may get you a lower price for the cleaning tasks you do hire out. We’re not necessarily talking about people’s desks here. Most workers have a good handle on how they manage the stuff on their own desks. What may look like clutter to some, may be “organized chaos” to another. If an employee gets their work done efficiently but their desk is a mess, leave them alone. They know what they are doing. Spaces that must be clutter-free, however, include lobbies, reception areas, restrooms, and document filing areas. One strategy is to digitalize as many documents as possible. Electronic documents do not take up physical space. Our good friends at Axis Business Technologies can help you with that. If, however, your office is dependent on paper, then you should have an efficient system for properly storing them. A simple feather duster can keep most computer screens and other office equipment looking fresh, especially if they are black in color. The particular environment of your office will determine how often this needs to be done, but if you see dust, give it a swipe with the feather duster. Be sure to get one with ostrich feathers. All others are worthless. Computer screens usually need to be wiped down since they get touched with pointing fingers all day. Use a good screen cleaning system from a tech store. Most office trash cans do not contain anything with offensive odors. But for those who must eat at their desks (not recommended, desks are filthy), it’s smart that lunch waste be taken to a bin in the breakroom for disposal. Otherwise, this trash will begin to smell even after one day. And if you don’t have a daily janitorial service provider, this stuff will fester. Getting your employees to handle these things on their own may seem like an impossible task, especially in the common areas and break rooms (and we haven’t even mentioned restrooms). That’s why we’re here. But by handling simple tasks on your own, if you do need to hire us for janitorial services, you can get a lower price for what can’t reasonably be done on your own. Also, check out these ideas before you call us to make sure you don’t spend more than you have to. Let’s face it; office floors can take a beating. Perhaps your office space has carpet that could use a commercial carpet cleaning service, or floors that show scuff marks everywhere, and are dull that could use a good strip and wax. Whatever the case, a clean office floor contributes heavily to the overall look of your office environment. Use a tennis ball to remove scuff marks from VCT floors. How to: take a plain tennis ball and carefully cut a small “x” into the top. To avoid injury, do not hold the ball in your hand as you cut it, but rather place it on a firm surface or use a vise grip. Once cut, insert the top of a broom handle into the “x” and using the tennis ball end of the broom rub the scuff marks out of the floor. But, what if the stain on your office floor is something worse, say, black tar from the parking lot or street? If it's a VCT floor, first try a painter's scraping razor to get the most of it up. An adhesive remover may be tried to get the rest, but beware, it may dull the finish. Try that first on a section of floor hidden from plain view and if it doesn't dull, then go ahead and use it on the stain. Tar on stone flooring is a piece of cake to clean up. I recommend using Goof Off (http://www.goofoffproducts.com/find-a-retailer). Just a bit of that with a paper towel and the tar is gone! So you need janitorial services at your commercial property. Here's how it usually goes: Get three bids, and choose the least expensive one. But those of you who've been through this process before, you know that's not always the best route to take. But what else should be considered before making a choice? 1. Ask about what equipment and supplies will be used during the cleaning process. Cheap vacuums don't do the job more expensive ones do. Hidden costs here could be lost time due to respiratory illnesses among your employees because cheap vacuums do not do a good job of removing contaminents from the carpet, and the cheap filters spew the rest into the air. 2. Good quality cleaning chemicals can keep your employee's illnesses down too. Don't be afraid to ask for literature on the chemicals to be used, especially for restrooms. We use Clorox Clean-up, which is awesome, for most surfaces. 3. Unfortunately, the use of undocumented workers is rampant in our industry. You do not want to be a participant in this illegal activity. Some janitorial service providers use this tactic in order to get lots of jobs through low-ball price bidding. Ask! While totally understandable, and usually prudent, to seek out the lowest price, beware of the "too low" price. If you encounter a bid that is far lower than the others you receive, consider that a red flag and inquire further. Look at the companies that submitted the higher bids and check their references and BBB pages. Baseboards are an often overlooked item in a janitorial or office cleaning contract. Just like in my previous post on window washing, it's usually because of a cost containment reason. But like windows, this needn't be such a concern, especially because, like windows, they only need to be cleaned a few times a year. And as you probably already noticed, assuming that your windows are clean enough to still let light in, your baseboards are very dusty at best, or scuffed and marred at worst. We can help though. Depending on the size of your building, we can handle this job for you rather inexpensively. It's difficult to give an estimate in a blog post due to the many different styles of baseboards, and the amount of attention yours need. If you've been using our office cleaning or janitorial services for a while now, you're probably already comfortable asking us to handle these little extras for you, so feel free to. We'll check them out next time we're in, and then give you a price. Like baseboards and windows, keep looking for those little overlooked areas in your office and let us know if you want us to handle these things for you. More likely than not, we got it! Have you ever heard "We don't do windows"? I have, and I always wondered "why not?" whenever I heard that. Although most commercial facility managers shy away from having their cleaning contractor handle their window cleaning needs, that need not be the case for your facility. Of course, if you manage a multi-story building with glass high above the sidewalk, a specialty window cleaning contractor may be your best choice. But for most of you, Springs Cleaning can easily handle this task. Usually, when an initial list of tasks is agreed to by Springs Cleaning and a new customer, window cleaning is not included. Not that we don't want to do this for you, but in most cases cost containment is a higher priority for the customer, while clean windows are at the lower end. But as time goes by, I'll bet those dirty windows start to bug most of you. And even though a professional office cleaning contractor services your facility, you may find yourself either cleaning them or upset that they are so dingy. Please, don't let this bother you! 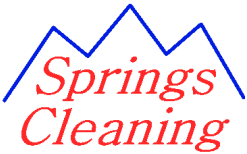 Even though window cleaning may not be part of your service agreement, Springs Cleaning will be happy to handle this for you. Whether you would like this task handled on a regular basis or just upon request, just contact us and let us know what you want, and we'll get it done. Cleaning your own office space may save money, but it doesn’t save employee morale, and may even be dangerous. Professional janitorial workers have the training and expertise to keep your facility and employees safe from many dangers, from wet floors all the way to potentially dangerous chemicals. Consider the following article, then consider having the pros at Springs Cleaning handle these problems for you. We’ve been handling janitorial services for many Colorado Springs companies for years and it’s worth the cost to ALL of our customers.